There is much to be enjoyed right now in the gardening year. Most of it involves my fireplace and an early Pamela Harper volume, but when I finish my coffee in the mornings and glance outside, I am reminded that it’s time to get my boots on and see what’s sparkling. 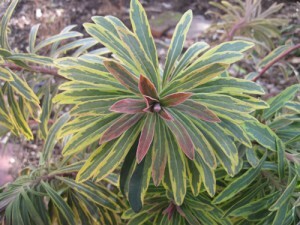 Heading the list is a new plant that has gone above and beyond for me this year: Euphorbia x martinii “Ascot Rainbow”. I have a soft spot in my heart for spurges, and this 2009 hybrid has not disappointed. It was a little pricey for a perennial, but I was intrigued by the circus burst of variegation on soft, narrow leaves, and bought just the one in the spring. More’s the pity. Now that I see what it could do, I wish that I had given it a brother and sister. Gorgeous yellow bracts centered with red were produced in the early summer and many survived well into the fall. Cold weather has left this pink-tipped beauty untouched while others around it show the true state of the season. 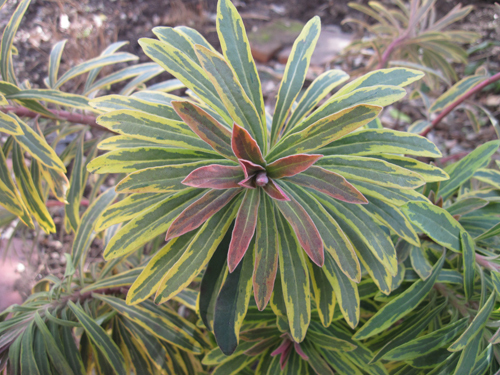 Next year, a bronze euphorbia nearby will work off that pink and pop it up a notch or two. Definitely on my list of winners. Buds on newly planted Camellia japonica keep me hopeful for mid- and late-winter interest in the shadier parts of my garden. On a whim I bought four beautifully healthy specimens from a garden club friend who had pulled strings and secured plant-sale fodder from a nursery down south. I did show a bit of self-control at first but in the end he got me. He always does. I am glad. Coming around a corner in winter to find a blossom-laden camellia is one of the joys of the winter garden. That’s what I’m aiming for. 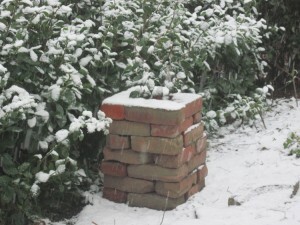 Little Jerry, Korean Snow and Minato-No-Akebono will write a new chapter in this gardener’s gardening life, bereft of camellias as it once was. Hopefully the chapter will not end with funereal rites – winter winds are exceptionally drying on the top of this hill and I already gave the brick wall to the fig. The Arum italicum is extraordinarily healthy and happy right now. Goodness knows the parentage of the plants I have, but the more I can get my greedy hands on, the better, as these promiscuous lovelies are quite good at getting up to all sorts of mischief in the undergrowth and making lovely crossed babies in the process. My common little patch sits up against a weathered water-bearer, deftly covering feet broken off at the ankle and the reason why she was pilferable from a garbage can last season. As many a gardener can tell you, arum hides a multitude of sins at a very naked time of year. I have moved stray pots to the heat-sink of my brick patio and there they must face the winter. They are disappointed, but so am I. My goal to get everything in pots planted in the ground by Christmas met with the usual “maybe next year” response from the part of me that doesn’t garden, but does cook, fix, clean and act as general dogsbody for children, husband and pets. 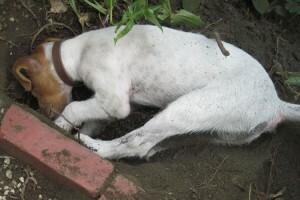 Speaking of which, my terrier has different goals in the garden. He was aiming for a complete unearthing of all newly bedded plants – buried as they are with a bit of bone meal and a kiss – and through studious devotion and an unnerving sense of smell, managed to uproot darn near all of them. Clever little devil. “I have to go outside before I have an accident” my foot. It is hard to smile faced with 20 crocus and 20 tulip sitting next to an empty pot after just re-planting three expensive Fritillaria imperialis. A hasty re-burial will mean crazy blooms in the spring, but there is no time to spare, I have a cup of tea with my name on it and a dog to kill. Curled up by the fire once again, pondering my discoveries, I find myself doubting that another year could have possibly flown by. 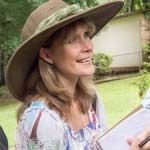 But perhaps as a gardener the year seems shorter somehow – measured as it is by ever-changing life cycles and not by the tedium of Prufrock’s coffee spoons. We are a year older, the garden and I – how is it that she only grows more beautiful? Have thought about this myself John!